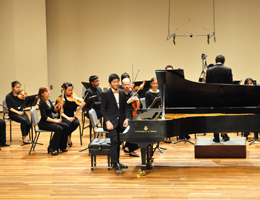 Moreover, Ip Piano School proudly offers the unique opportunity to participate in an ANNUAL CONCERTO CONCERT held at Boston University's Tsai Performance Center. It allows the students to experience playing with a full orchestra. This unique experience generates motivation, self-confidence, and establishes self-esteem. For details, please check our Concerto Policy. An annual non-refundable registration fee of $30 is due at the time of registration. 24 hours notice must be given for any changes or cancellations in a lesson. There will only be one make-up lesson per semester. Each student enrolled must purchase a concerto ticket for The Annual Concerto Concerts. Each student planning to participate in the ABRSM practical and theory examinations must take extra theory lessons (grades 1, 2, 3, 4, 5 and aural classes grades 6, 7, 8). All Registration fees and lesson payments must be made by the first lesson or class in each semester. Check and cash are accepted. Any bill not paid in full at the time that lessons/classes begin will be assessed a $25 payment plan fee. Tuition is billed every two months and there is absolutely no refund once classes and private lessons begin. One private lesson absense per semester will be made up. Make-ups are not given for students missing classes/group lessons. If you can't find a parking space for drop-off or pick0up, please call the school at 617-542-9129, and an Ip School representattive will come down to meet your child at the 200 Lincoln Street front door. Make-ups will be offered when classes or lessons are canceled due to weather conditions. If you are not sure whether the school is open during the bad weather, please call 617-542-9129.